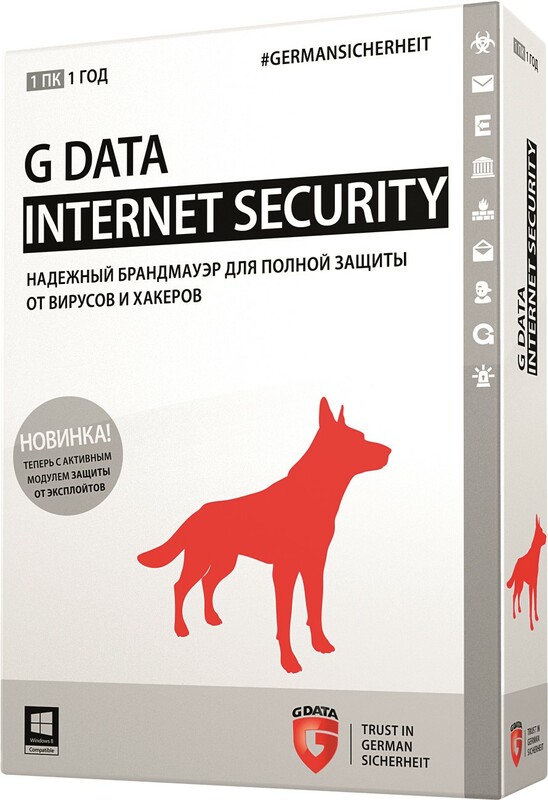 G Data InternetSecurity provides the best operational protection against viruses, hackers, spam and other threats from the Internet. Built-in parental control, use of cloud technologies and system control module. Security modules are very easy to configure, work seamlessly in the background and do not slow down the system. Internet security: G Data Web Cloud blocks dangerous websites. Mail protection: G Data Mail Cloud blocks virus outbreaks. Protection of online banking: BankGuard protects against dangerous banking Trojans. Behavior Monitoring: detects suspicious activity of viruses. Protection from hacker attacks: a firewall in the background without any unnecessary questions. - Qualitative detection of viruses using a combination of two engines. - Resource-saving technology based on fingerprinting and background scanning during PC idle time. - No spam - pesky letters are blocked automatically. - Parental control protects against sites not intended for children. - Protect your Android ™ smartphone for free from viruses and mobile threats. 2. Double-click on the installation file to start the installation process. 3. Select the software installation language. 4. Select the type of program installation. 5. Read the license agreement and agree to its terms. 6. Then select Full version and then enter the registration number to register the product. 7. After installation, restart the computer. After that, the G Data software is at your disposal.